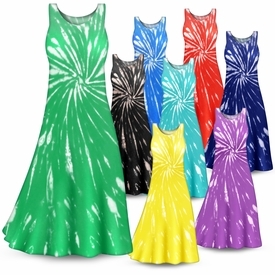 You will just love the way you look in this pretty princess cut dress in a Tie Dye Swirl Pattern. It is lightweight and made of a very stretchy poly cotton fabric similar to a T-Shirt. It's available in plus sizes 1x 2x 3x 4x 5x 6x 7x and 8x (Check measurements below!). Standard length of 50/52. Please note that all of our Tie Dye products are meticulously handmade by an expert artist one piece at a time. Each Tie Dye pattern is unique due to the handmade nature of the coloring process. No two are alike and color may vary slightly. The subtle variations make your purchase special and one of a kind.